The UK based indie studio, RisingHigh Apps, has been successfully creating casual mobile games using Buildbox since the very beginning. Fatal, 99 Moons, Parallels, Impossible Caves, Flite, and Dashy Panda are just a few of their hit games. RisingHigh has been featured by Apple in the “Best New Games” category 10 times. They’ve also received several “Get your Game on” features by Amazon as well. We were honored to have the opportunity to chat with Kevin Wolstenholme, Founder of RisingHigh Studios, about game development, getting featured by Apple, and his experience with Buildbox. Buildbox.com: As an indie game developer, what’s your creative process for coming up with new game ideas? Kevin Wolstenholme: It’s a little hard to pinpoint the inspiration for our games as ideas usually come out of nowhere and when we least expect it! We try hard when starting a new project to stay away from the App Store and use our ritual morning walk to bound ideas around. Getting out and about usually triggers something and we find talking opens up new trails of thoughts away from the screens and other influences. Once we have that seed of an idea, we start prototyping as fast as we can which 99% of time takes that idea and moves it in a completely new direction. We find ‘doing’ is a powerful way to develop ideas and creating nice ‘flukes’ and unexpected outcomes. How do you approach level design? Is there any particular strategy that you prefer to use? For the level design we usually begin with pen and paper to get some vague concepts together, but mostly it’s a really organic for us and we just dive straight into Buildbox and start moving stuff around. I always insist we stay away from what I call “Blank Screen Syndrome”. It’s totally crippling and often overwhelming looking at an empty monitor, so we just start throwing something onto the screen to get the process moving forward. There’s always a ton of design idea “scribbles” that are regularly drawn in notepads as inspiration can hit anytime and many of our games/levels have originated from these mad, rough sketched designs and ideas. Often we’ll hit upon something pretty quick or at least work out what we don’t want, we bin way more than what we keep. After that, we build out, play and test like crazy. We judge level design in terms of Feel, Fun, Flow and Emotion. We try and evoke 1 part of each when building our games and levels, if there’s too longer gap between any one of these elements we try and address that as soon as possible. This is something that we’re always trying to improve upon and think we’re getting better each game we do. RisingHigh Studio has been featured by Apple an impressive 10 times. What do you think is the secret to getting your game featured by Apple? Wow, Great question! It’s really hard to say why some games are featured and others aren’t. We certainly try and execute our games to the highest quality in terms of polish and production, along with introducing our own twists on gameplay mechanics to set us apart from the rest. Apple has always been focused on user experience so it’s important to keep this in mind, we put equal amount of effort on our UI/UX as we do in the games itself and it has served us well so far. We also keep a close on eye on which games Apple are featuring each week. Every Friday morning we go through the new list to dissect the games, icons and marketing to find any recurring patterns or trends. Out of all of the popular platforms such as Android, Apple, Amazon, etc. which have you’ve seen the most financial success with? And in your opinion, why do you think that specific platform is best for generating income? Hands down it would be iOS for generating revenue. For Google Play and Amazon, we’ve actually never properly tried to launch on these stores which may sound surprising to most, but for us, we wanted to concentrate on Apple. We did have some features on Amazon when we first dipped our toes into Android, but we found our casual games didn’t do well at all, so we focused in on the platform that gave us the best return. The Steam store has also done really well for us so we’ll definitely be building for desktops more in the future. What is that one piece of advice that you wish someone had shared with you, when you were just starting out in the app business? Again, great question and I honestly thought long and hard about this one. I’m not really sure there’s any wisdom that would have changed anything for me. I realize it may sound a bit crazy, but I truly believe that going through the process and being hands on is the best way to learn this or any business. If I was starting out now however and was asked for advice, I’d most likely say start with a small game and identify how you plan to get traffic, it’s by far the most important part of the process. What should we expect to see in 2016 from RisingHigh Studio? Any upcoming games or announcements to be on the lookout for? 2016 is going to be a very experimental year for us in terms of platform distribution. We’ll be releasing Impossible Caves which will be our 2nd game on Steam, rebuilding it for a proper desktop experience in Buildbox 2. We also have 3 titles hitting the Apple TV in June/July so looking forward to see how that goes. Expanding onto Google Play, Amazon and the Windows store has already started. Also how has using Buildbox helped with your development process overall? With Buildbox, and now Buildbox 2, it has empowered Jilly and I to build pretty much what we see in our minds eye and it’s amazing. I’ve tried a few of the other game builders out in the market but gave up pretty fast, nothing comes close in terms of ease of use and low learning curve. The most inspiring thing for us is to be able to run with ideas. There’s nothing more satisfying and motivating than to be in the middle of building out a game, come up with a “hey… wouldn’t it be great if” idea, and be able to execute it while in “the mode” so to speak. The scope of Buildbox 2 is just on another planet! It’s opened up so many different ideas for us and our game design possibilities have been pushed to completely new achievable heights, very exciting times! For anyone thinking of entering this business and passionate about building games, especially for non-coders, I cannot recommend Buildbox highly enough. Buildbox 2 is now at the core of everything we do and we’re super grateful for Trey and the team for making it happen, you guys rock and can’t wait to see what the future holds. 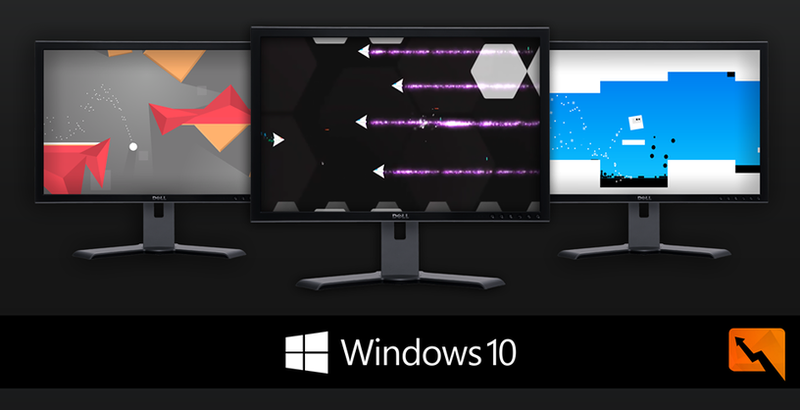 With the new Universal Windows Platform integration in Buildbox 2.0, how was your overall experience using the features to port your game over to Windows UWP? The process was extremely easy, surprisingly so and I’d go as far to say is probably the easiest out of all the stores. We’re super excited with the new export features Buildbox 2 has coming, especially getting involved with Xbox and see if we can enter that market with big screen first titles in the future. You can find out more about RisingHigh Studio on their website. I’m looking forward to seeing a reply to Felix’s question – 5 days ago! Thanks for this interview! There were some great nuggets in here that I can take away that will help me succeed!!! Great one. May I ask a question about buildbox game business: Does making buildbox game under this direction pay a living for production team so that you yourself can turn into full time entrepreneur/ hire a colleague to sustainably producing games?